A new 39.3 metre motor yacht, to be built by Italian yard Cantiere Delle Marche under the project name of Flexplorer, has been listed for sale by Jeremy Comport at Ocean Independence. With naval architecture by Hydro Tec, the Flexplorer will be built in steel and aluminium to RINA class by CdM with delivery set for 2021. Her name indicates both her explorer soul and the flexible uses possible, while retaining a quality superyacht finish. Quiet, comfortable and economical cruising is also achieved through her full displacement hull design. Although a new owner would have carte blanche in selecting an interior designer, this yacht for sale is currently configured as having accommodation for 10 guests in five en suite cabins along with crew quarters for up to six members of staff. She will boast a vast aft deck and easy access to the water for toys, tenders and guests while a voluminous interior offers plenty of space for relaxation and entertaining. On the technical side, twin Caterpillar C32 diesel engines will power her to a maximum speed of 14 knots and a highly respectable range of 5,000 nautical miles at her cruising speed of 10 knots. For added comfort and safety at sea and in port, she will be fitted with zero speed stabilisers. 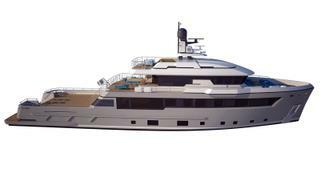 The Flexplorer motor yacht is asking €17,300,000.